M is for mushrooms, mainly Morel mushrooms. 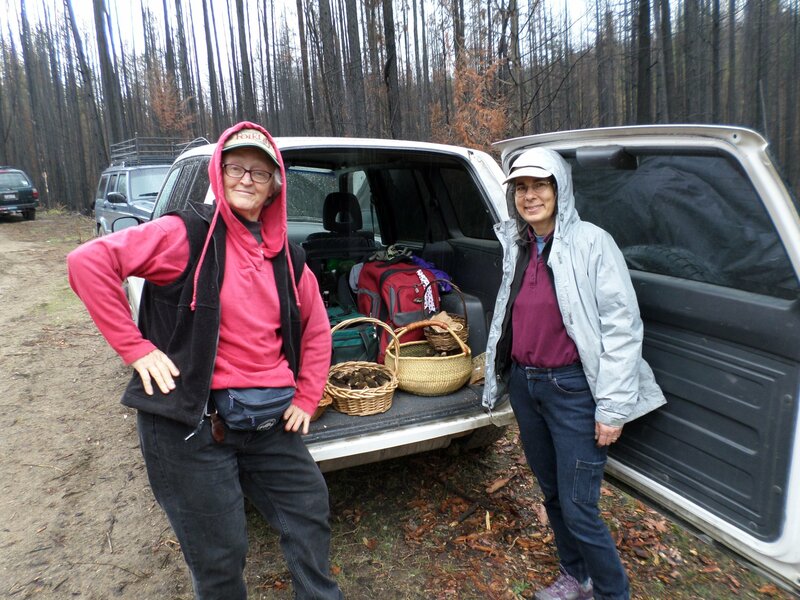 We have taken 6 mushroom expeditions, mostly in May and most were more successful than the one before. Picking morels is a lot like playing hooky. We have lots of gardening and I have lots of maps to work on. 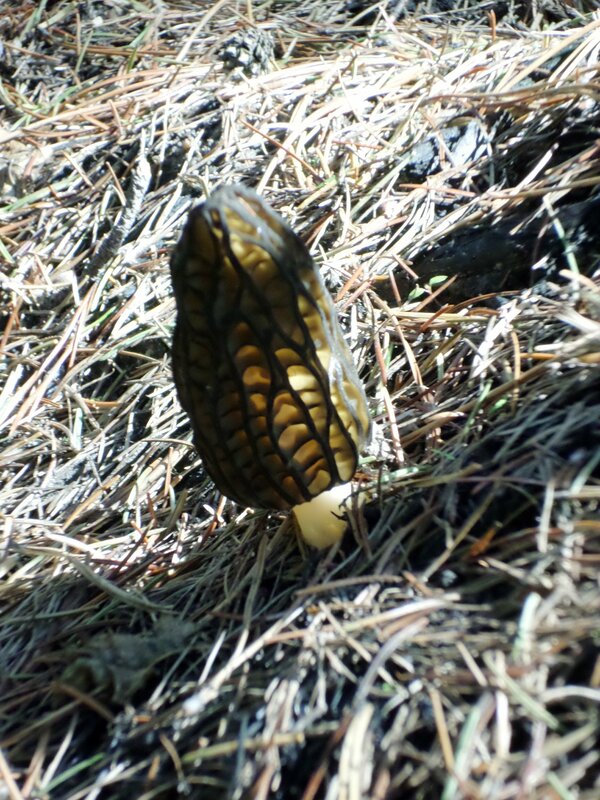 But a million acres of morels is (hopefully) a once-in-a-lifetime opportunity. 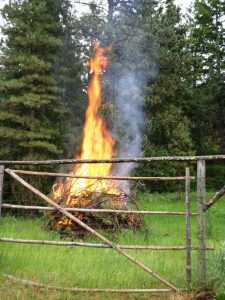 Although a million acres burned in Washington State last year, the biggest local fires were the Carpenter Road fire – that was in last month’s blog, the Renner fire, The Graves MT fire and the Stickpin fire. M is for mistakes and mud. We brought our friends Tove and Doug up to Thompson Ridge Trail in the Renner Fire to introduce them to picking morels. 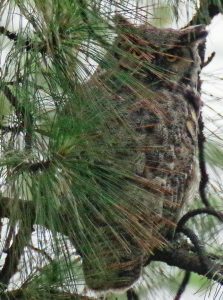 We did find some along the trail, but we were a bit early and they were few and far between. Then it started to rain and we sat it out steaming up the windows in the Rav4 and eating lunch. On a whim, I continued down the road to a lower elevation through a lot of mud. The rain stopped and we hit a sweet spot there and everyone filled up their baskets and bags. Good day on the Renner fire, about 30 pounds between us. M is for mountain and mistake. 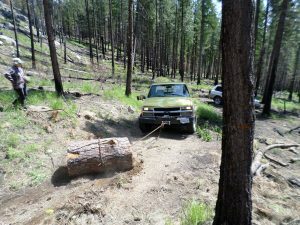 On May 13th we worked our way up the south side of Graves MT looking for morels again with no luck and came to a huge pine tree fallen across the road. We were about to turn back when a yellow pickup came up behind us. It turned out to be Jeremiah Jones, the guy who plows our driveway in the winter, and his father, Greg. Jeremiah had a chainsaw and a chain, and pretty soon the part of that pine tree blocking the road was over the bank. But we still didn’t find any mushrooms up the hill and went back to the highway, only to find Jeremiah with his pickup broke down. 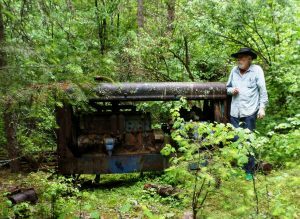 We gave him and his father a ride to Sandy’s Drive In where his wife was working and headed back up Deadman Creek to the other side of the Graves Mountain Burn. We found a few mushrooms and were about to turn back when Cheryl suggested there might be more across the creek. I got one leg completely soaked crossing the creek but there were more morels than I had ever seen on the other side. I picked a basket full but it was so late that we had to leave just as it was getting good. M is for Meals, and we have had some good ones with all of these mushrooms. But it’s also for maps and the jobs were stacking up for Map Metrics while we were out picking. 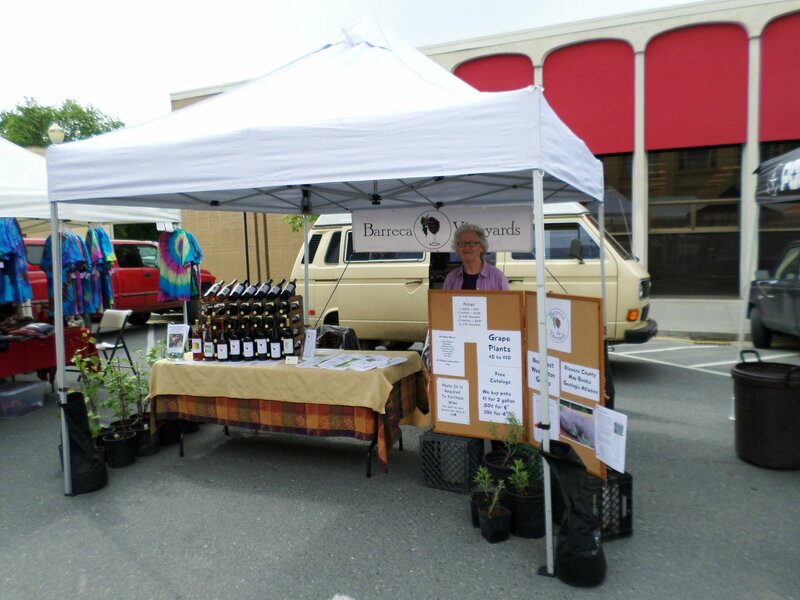 You might add Marketing, a good M word and I got a start on a Barreca Vineyards Facebook page at the “Digital Day Camp” held at the newly remodeled Kettle Falls Library. But with too many other things going, it is still just a start. 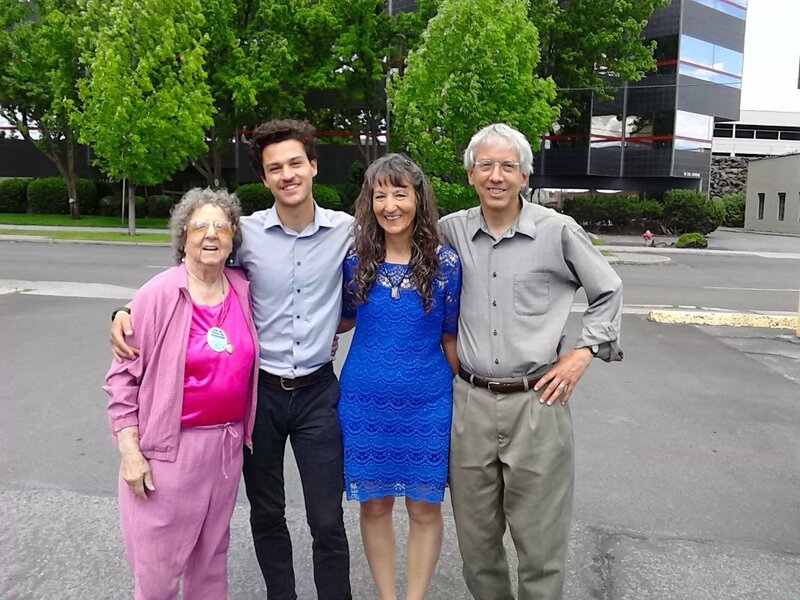 M is for Mother’s Day and I spent most of it attending the graduation ceremony of Benjamin Stout, my cousin’s son, from Gonzaga University at the Spokane Arena. Several thousand graduates are impressive, but after 3 hours of listening to names, you get worn down. 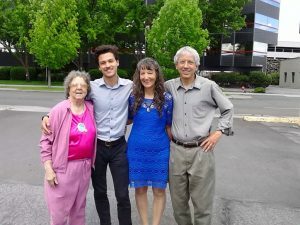 I had to leave the Stout family and my aunt Mary Jo Rumball-Petre right after the ceremonies, do some shopping and get back for a dinner date with Cheryl, C-Ma Barreca, at Lovitt Restaurant. M is for Market and we started selling wine, grape plants, map books and eventually mushrooms at the NE Washington Farmer’s Market in Colville on Wednesdays, something we will do for the rest of the summer. The market has been good except for the (M is for) mistake of not getting the table squared away and watching our full wine rack crash on the pavement one morning. We recovered and now the table is rebuilt and stronger than ever. M is for Movie and we watched Through the Looking Glass one Sunday. M is also for moisture and we finally got some in the middle of the month. 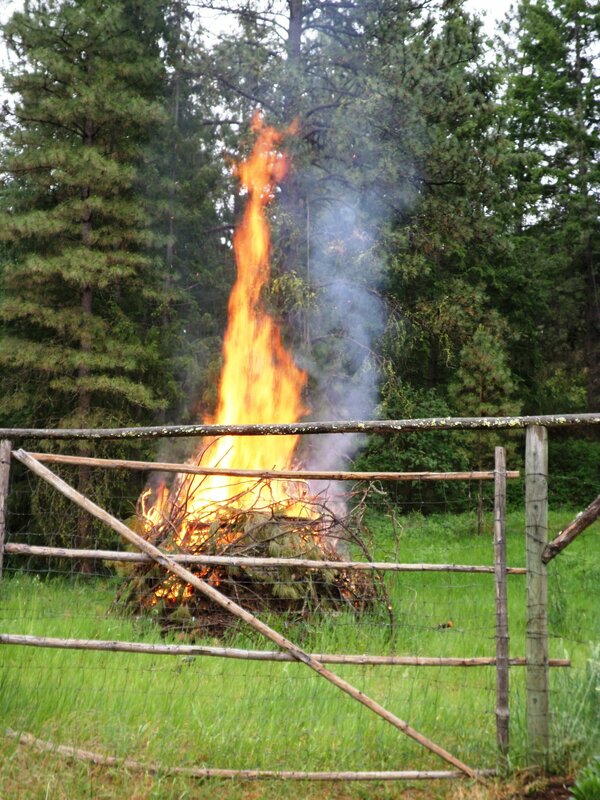 We wasted no time in burning our giant slash pile while it was wet outside. Now it is in the 90’s and dry again. M was for Morels again when my sister Jeannette and her husband, Bill Yake, came over from Olympia to visit with us and April, Tony and James and to pick morels. We hit it big on Long Alec Creek with Bill and Jeannette plus my daughter April and her guys, Tony and James Houston. 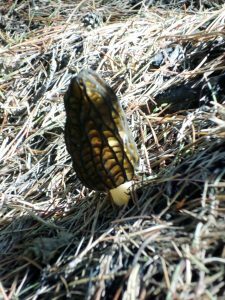 We were finding fresh morels at 4500 feet and above. M is for mine and the next day Jeannette, Bill and I struck out to find the lost Cuban Mine that Bill’s great uncle Erwin Yake had developed right across the river from us. 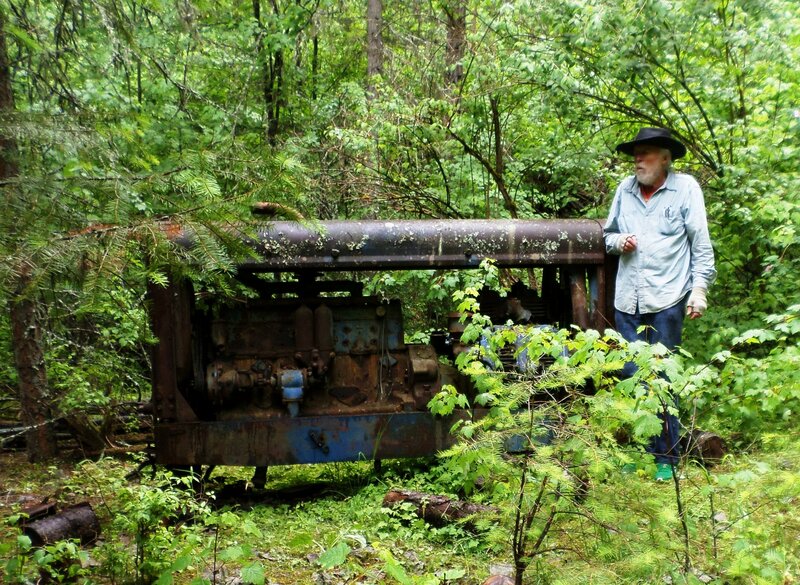 We found the mine and a whole lot more. It helps to be into maps and history. It was a lot of exercise and we came back to a dandy meal that Cheryl cooked with morels and asparagus on the side. M is for Music and Monday. Bill and I played music together Sunday night, but we both had a long day scheduled on Monday. So it was a short night. Monday, before he left, Bill took a picture of a Great Horned Owl in our woods. He posted it on facebook with comments about how they eat everything you can think of including house cats. Our cat, Gray-C, did not come back into the house that night. But at 4 AM I found her still in the garden and a couple of (M is for) mouse heads left in the middle of the path. Then I got some sleep. M is for Memorial Day and we had a great day picking morels with Tove and Doug the Thursday before that weekend. This time we went up Little Boulder Creek. The morels were big and fresh. We started passing up little ones and came home with about 50 pounds between us. By this time we had 2 gallons of dried morels and didn’t need more. 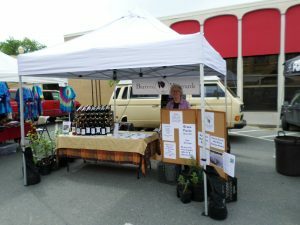 So..
M is for Marketing and on Memorial weekend Saturday Cheryl took morels to the Farmers Market. She sold out in 45 minutes and went on to sell plants and map books too (we didn’t take wine). 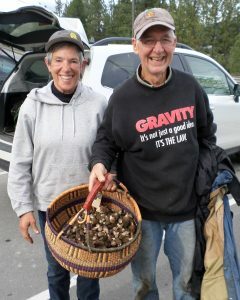 So Cheryl and I picked more morels on Memorial Day even higher on Little Boulder and sold those on Wednesday. But by then we are into June and out of morels. So there you have it, the Sesame Street version of our Month of May. No more morel mania. I think J will be for June and jobs that I didn’t finish in May. You two are living a bountiful life! I am glad you got in some travel, because it looks like you are going to have one Hooooot summer! I assume no bottles of wine were lost in the shelf misshap? You can certainly tout your wine as being in the old country tradition! Actually we lost 4 bottles but learned our lesson (I hope).